This beautiful Grade II listed cottage built in 1600 boasts all of its original features, so its jam packed with history. At the same time the decor has been updated to allow a fresh, coastal feel but retaining the coziness of a low ceiling-ed, exposed beamed cottage. If you are above 6ft 3" you will not fit into this cottage as its ceilings in the main living area are very low, but we feel it adds to its charm. The kitchen and master bedroom in contrast are later additions to the house and so have full height ceilings. This is a house that has evolved over the years and has a story to tell if only walls could talk! With a fully equipped modern kitchen and bathrooms you will not have to suffer the inconveniences of period living but instead get a taste for the life of a fisherman that would have fished on the island hundreds of years ago, with all the modern day comforts! The house has a large rear garden with beautiful views out towards the estuary and a small jetty where at high tide access can be gained to the water, for watersports. At the front there is a large driveway with parking for several cars. The house is situated at the end of a long private driveway servicing just 5 houses all tucked away in the "Old City" part of the village also known as The Anchorage due to the Sailing/Yacht Clubs and Chandlers. This means that although the position is very secluded, quiet and peaceful you are never more than a few minutes walk from places to eat the lovely seafood on offer or drink in the local pubs. A few more minutes walk will take you to the centre of the village where you will find everything you need. With a top quality butchers, post office, bank, shops and supermarkets, it means that once you have arrived, you'll never need to leave the Island again till its time to go home! Mersea Island is rapidly growing a reputation as a "foody haven", and just a few moments walk from Crabtree Cottage you will find the famous Company Shed. From this small "shed" by the waters edge you can eat freshly caught seafood moments out of the water. People trek from London to this unpretentious eatery each weekend to experience the fresh seafood on offer, its reputation is spreading so wide. There are plenty of other high quality, again unpretentious venues to eat the local seafood or other foody delights on offer, all accessed just a few minutes walk directly from the house. No need to take the car, just walk and have as many drinks as you like! Maybe sample each of the Mersea Island Breweries beers or Mersea Vineyard wines! We were brought up in rural Essex, so having lived in London for work for a few years we soon found ourselves missing the Essex coastline. We decided to look for a weekend home to escape from London and to spend more time with our friends and family. So the search began.. Having looked at other outlying villages in our part of Essex, we soon found that Mersea Island was the place for us. Although growing up only a stones throw from Mersea, we never fully appreciated it growing up. 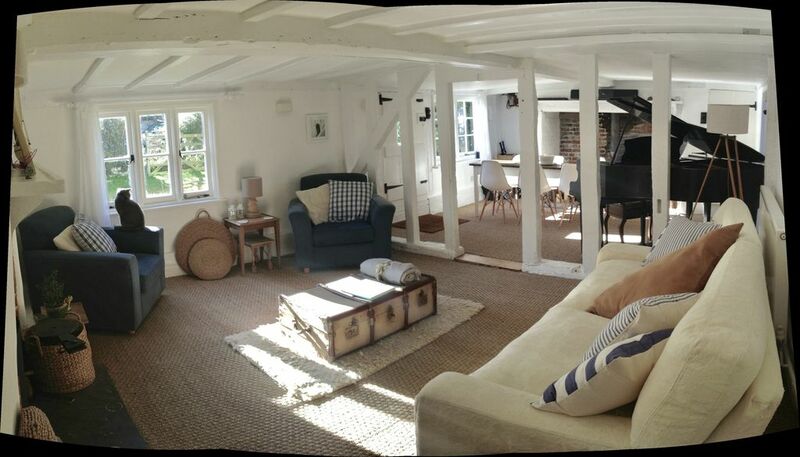 So when we found Crabtree Cottage in its amazing location, we soon realised we'd found a real gem in both this cottage and in Mersea Island. It really has its own charm. Mersea Island is a special and unique place that enchants you from your very first visit, you'll want to return time and time again. One family bathroom includes a bath, basin and toilet. An en-suite shower room and separate toilet to master bedroom on ground floor. Cleaning / Towels / Bed Linens: We ask that you bring your own bed linen and towels please. Open plan lounge/dining room, with exposed original beams. Large inglenook fireplace with pot-belly wood burner to dining area. Additional wood burner to fireplace in lounge area. Low ceilings and exposed timbers abound, with a fresh coastal feel. Basic pantry items including tea, coffee, sugar. Fully stocked kitchen with all dishes and utensils to cook any meal. West Mersea is a prominent Sailing Community with two Sailing Clubs and easy access to the water for boats of all sizes. large deck adjacent to kitchen with beautiful estuary views. West Mersea is situated in close proximity to many Golf courses. The closest being Five Lakes Golf & Country Club (Crowne Plaza Resort) situated just 8 miles away at Tolleshunt Knights. There are at least three other courses situated at Colchester just 10 miles away, including a Driving Range. Crabtree Cottage is our second home, we use it as our escape from London on weekends. But we decided its such a special place we should share it when we are not there, its a shame to have it sit empty! Whilst we have decorated it to our taste, we have tried to leave as many of the original features in tact as we can, to retain its history. As such we feel its not had its heart ripped out; instead sympathetically restored to make a cosy, comfy cottage which is a pleasure to spend some quality time in whilst on the Island. Expect characterful quirks, cozy evenings by the wood burner, or star gazing on the rear deck with easy access to all the Island's amenities and most of all an enjoyable stay on Mersea Island! Outside: There is a large private rear garden with a large deck area, with a BBQ and table and chairs for alfresco meals. In the summer we eat most of our meals out on the deck. From the garden are stunning views of the Blackwater Estuary. You can hear many types of sea birds day and night, and the tinkling of the Sail Boat's halliards during windy times, all wonderful coastal sounds right from the back garden! At the front of the property is a large driveway with parking for several cars. Cleaning / Towels / Bed Linens: We ask that you bring your own bed linens and towels, but we do provide bedding. A full set of duvets for all weathers is available, along with pillows. We provide tea towels and bath mats. A delightful stay in a perfect location. Crabtree Cottage is snug, very well equipped and met all of our aspirations for a relaxing and restful stay. Quirky property in beautiful location. A quaint cottage in a peaceful location. We enjoyed our stay at Crabtree Cottage during Storm Gareth. The cottage is down a private lane with estuary views from the rear kitchen and downstairs bedroom windows. The garden has a lovely terrace overlooking the views and we experienced a glimpse of the sunset before the clouds got in the way. It’s just one of a handful of properties in a very peaceful location but within a few minutes walk from the waterside and eateries. We would say the cottage is in one of the nicest locations in West Mersea. The walk from the rear of the garden cannot be accessed but this is no problem because you can pick up the walk just minutes away. We had the most amazing seafood platter to takeaway from West Mersea Oyster Bar and ate at The Coast Inn which is a friendly pub with very good food. We walked miles locally with our dog and in Cudmore Grove Country Park. The park has a very good playground should you be staying with children. We walked around the water and a murmiration of starlings gave us a beautiful display. There was lots of birds and ducks so it’s a photographers paradise. It must be beautiful in summer. We loved our stay in West Mersea and would like to return one summer to experience the yachting vibe and to eat fresh fish outside one of the little fish bars in the sunshine. What a lovey review, how descriptive it is! For anyone that has not visited Mersea before they will certainly want to after reading this delightful review! Its always so nice to hear from guests that enjoy the cottage and Island as much as we do! We would love to have them back in the summer so they can see how its even better at that time of year! Had a lovely time exploring Mersea over New Years. The house was super cosy and the fire place was a real treat. The location is really great! Had a lovely time and would stay again. Its so lovely to hear of another happy stay at our home. Unusually not being there for Christmas and New Years ourselves, its nice to hear of others enjoying the place as much as we do. Really enjoyed our stay here, great quiet position but within easy walking distance of brilliant restaurants. Weather very cold whilst we were there (middle of November) so didn't really get to enjoy the lovely gardens but must be amazing in the summer months with beautiful views over the estuary. Cottage very cosy with warming log burner and very comfy beds. Another happy set of guests, that's always so nice to hear. Yes indeed its very cosy in the winter, but as you say its amazing in the summer out on the deck with a perfect view of the sunset with a glass in hand! A very relaxing time away by the sea. West Mersea is a sailing community with its two Sailing/Yacht clubs at its heart. Crabtree cottage is situated in the Anchorage area of Mersea, the heart of the sailing community. You will find all amenities for this sport within moments of the cottage. This is an ideal spot for a sailing holiday or simply a base for visiting West Mersea's famous Regatta week in August. Just over the Estuary situated at Saltcote is the RSPB Old Hall Marshes for Bird Watching. In addition at the nearby Abberton Reservoir Visitor Centre is Essex Wildlife Trusts' venue for Wildfowl Watching. The Estuary is visible at the bottom of the garden where you can take walks along the sea wall, all the way round the Island if you are feeling energetic! Both East & West Mersea boast beaches. West Mersea's Monkey Beach is only a few minutes walk from the cottage along the waters edge, past the pubs and eateries and a 5 minute drive to Cudmore Grove provides access to the beaches of East Mersea with its mini cliffs. West Mersea is situated just 10 miles from Colchester. Access to the A12 is either via Colchester or alternatively via Braxted Park which can be reached in 20 minutes. From there it is 45 minutes to the M25. Mainline railways can be accessed at nearby Colchester, Kelvedon or Witham with trains to London, Norwich and further afield. The nearest airport is Stanstead situated 35 miles away. Colchester is 10 miles away and is Britain's Oldest Recorded Town, which boasts a Norman Castle and Roman Wall among many other architecturally important sites. Tiptree is just 11 miles away. With its world famous Jam Factory, this village is steeped in history with the Wlikins Family producing jams and preserves from this site for well over 100 years. Visit the Jam Factory Tea Rooms for lovely cream teas. Vist Dedham only 16 miles away; the scenery depicted in Constables famous paintings.